Following my homemade moisturizing lotion recipe, I would like to share this translucent face powder recipe. I have been using this powder for over a year now and have received a lot of appreciation! Initially I really didn’t trust this recipe. You know, the commercial face powders look excellent and might even give you excellent results. They are so fine and set your make up perfectly giving you a polished look. Heck, they do even smell great! But the problem is with the harsh chemicals used. Given that you may use a translucent powder nearly everyday, or at least 5 times a week, this is simply not good for your skin. And the talc in the powders could contain asbestos (in some countries). And asbestos could cause cancer in and around lungs when inhaled. So I just wanted to eradicate the commercial talcum powders, or the translucent powders altogether. So I found this natural, DIY solution. This recipe is not only natural but it is extremely cheaper compared to the store-bought powders. Why? Because it only has two (yes 2!) basic ingredients, and 3 optional ingredients as per your preference and usage. The initial purchasing cost of all the ingredients might look a bit expensive, but all these ingredients have a long shelf life. And you can use them for several batches of face powder or body (deodorising) powder. Worst of all, if you don’t like this powder or simply decide not to use it anymore, you could use all the ingredients in cooking! Please note that this is not a commercial, ready-made powder with luxurious chemicals. You are going to make it yourself in your kitchen table. I find it fun to make. But be prepared for some mess. Also you might want to do a lot of experimentation to get the perfect shade that you want (by adding cocoa and/or cinnamon powders). Hence you might want to test by applying to your skin at every step. So, I suggest, at every step, write down how much you add of any ingredient, so in the end when you get your favourite powder, you could add up the quantities in all the steps and have the perfect (and your own) face powder formula! The con here is the trial and error. Let’s dive right into the recipe now. 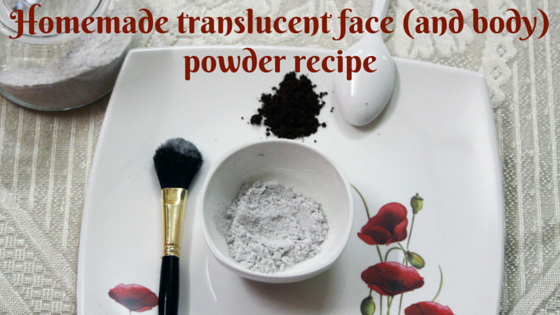 How to make your own translucent face powder? 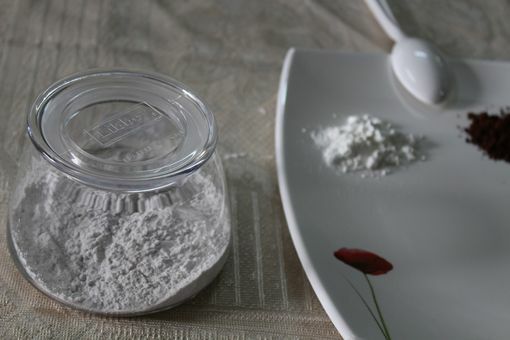 Take 4 tablespoons of arrowroot powder in a bowl. Add in about 1/2 tablespoon of Cocoa powder and give it a good mix. 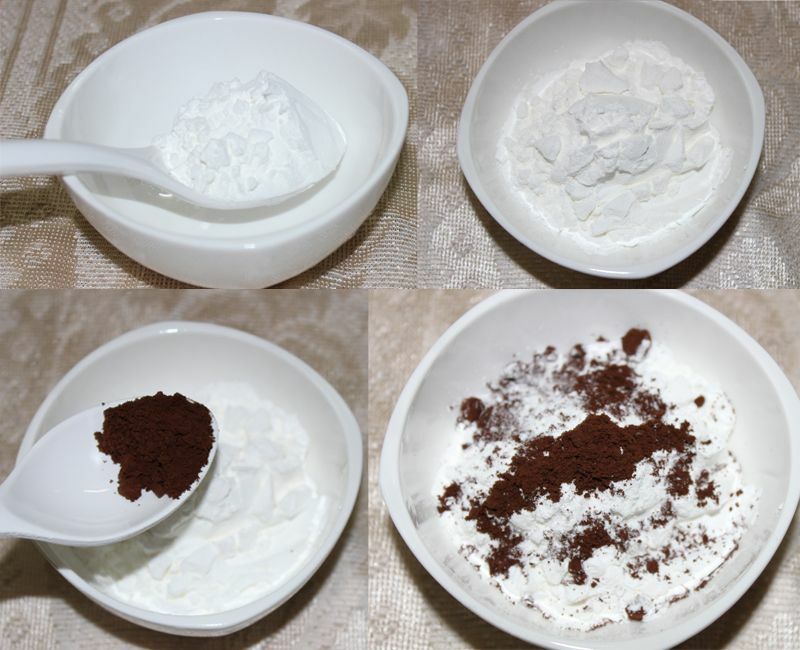 Now you might want to add more or less of Cocoa powder depending upon the complexion of your skin and how light or dark you want the powder to be. Whatever your complexion is, make sure the powder is much lighter in shade than your complexion. You don’t want to make it darker than your complexion for sure! You can store the powder in a container and use it with a make up brush. A face powder has lots of benefits apart from putting your makeup together. When it comes to makeup it helps to set everything nicely and give you that polished look. Other than that, it helps with hiding your fine lines and blemishes. It absorbs oil in your skin. It also helps hold your make up for a long time! So after you are done with your make up, dip your brush in the homemade translucent powder, tap off the excess and apply all over your face in a circular motion. As to the fragrance of this face powder it does smell a bit like chocolate because of the Cocoa powder. But the smell is not over-powering and it does fade over a short period of time. However if you don’t like the smell of cocoa, you could add a few drops of essential oil with your final powder (after you have mixed the cocoa powder well). Keep mixing while you add the essential oil drop by drop so that lumps are not formed. You could add rose, sandalwood, or lavender. I alternate between rose and lavender usually between batches. 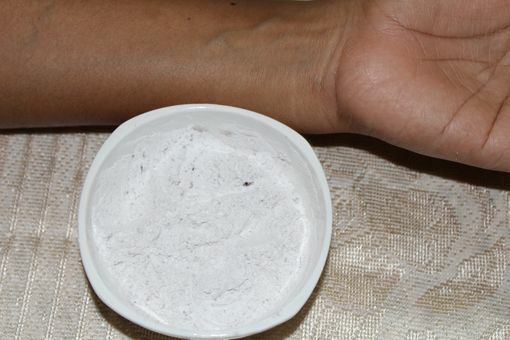 If you want to use this powder as a body powder for deodorizing or other reasons, you could add 1/4-1/2 tablespoon of baking soda (for 4 tablespoons of arrowroot powder). Baking soda is a great deodorizer, and has a lot of benefits for skin (that includes fighting acne). However, I also know that there are mixed opinions about using baking soda on skin. As I said, I’ve been using this powder for over a year and have found no problems. For the face powder, if you want a warmer look, you could add 1/2 teaspoon of cinnamon powder. Some people will find cinnamon powder to be irritating to the skin. I personally haven’t tried cinnamon on this recipe – so I can’t comment on this. But cinnamon is an antiseptic, it helps with anti-ageing, it improves your skin tone and helps treating acne! If you decide to include cinnamon to this face powder, make sure that you do a patch test on the inner side of your arm, before applying all over your face. If you like this powder (as face powder and/or body powder), please be sure to share it with your friends! I hope arrowroot/flour would not cause any skin problem with daily use. Also, what about people with acnes and pimples? This recipe would suit which “skin” the best? Thanks for sharing. Do visit my blog when you have the time. Depends on your skin tone 🙂 If you are worried, this could just make a good body powder!